As much as I enjoy heading out to the city for brunch, nothing compares to pampering loved ones at home with a beautiful brunch spread. There is something extremely precious and nostalgic about waking up and smelling the fresh scent of eggs, bacon, or waffles being prepared in the kitchen. 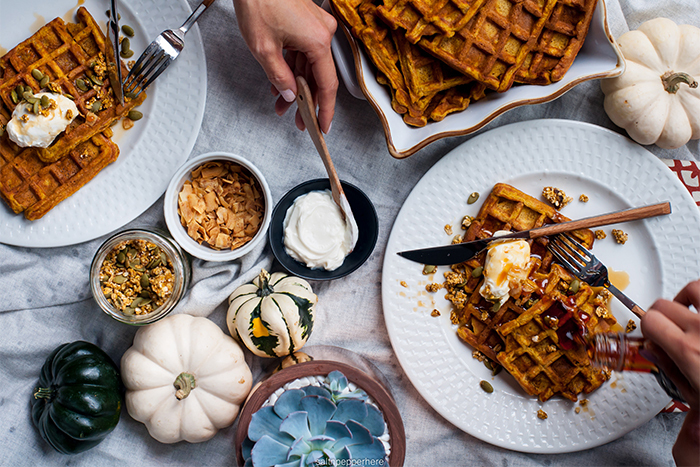 With Canadian Thanksgiving approaching this weekend, I thought what better way to celebrate than to wake up to a delicious and festive brunch? For those of you who follow along know that I love hacking recipes and pulling together simple dishes to enjoy. I was so lucky to have reunited (believe it or not via Instagram) with my super talented friend and true foodie, Sonia of saltnpepperhere whom I haven’t seen in over 6 years! I decided to invite her over to my home last weekend to create some Thanksgiving brunch magic. 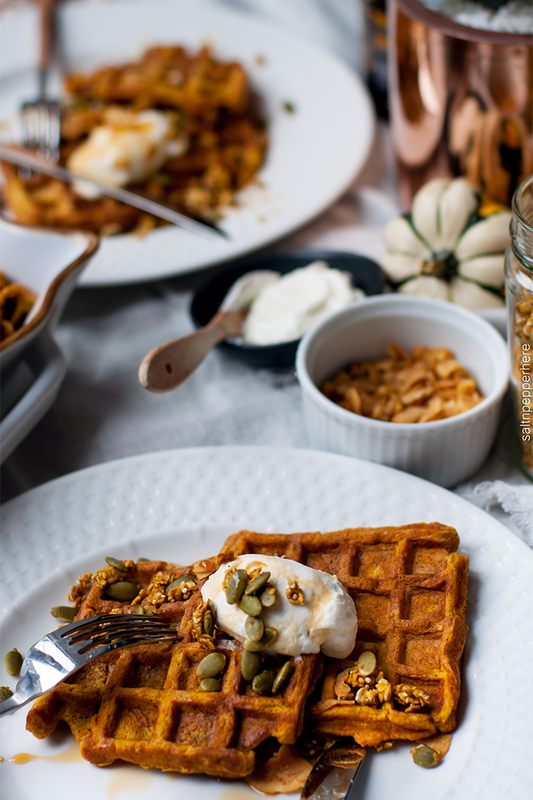 Sonia made these delicious Pumpkin Waffles (original recipe here) and we spent Sunday morning having a blast catching up. 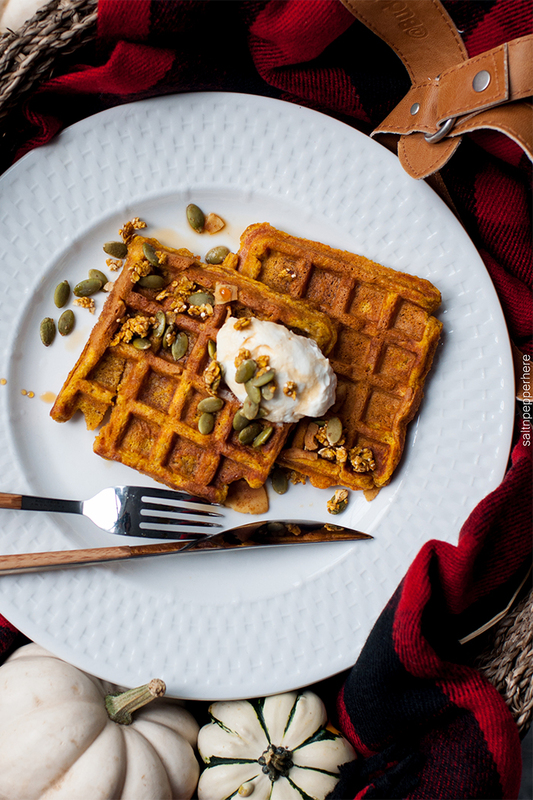 Read further to see how you can too prepare Pumpkin Waffles for your Thanksgiving brunch! 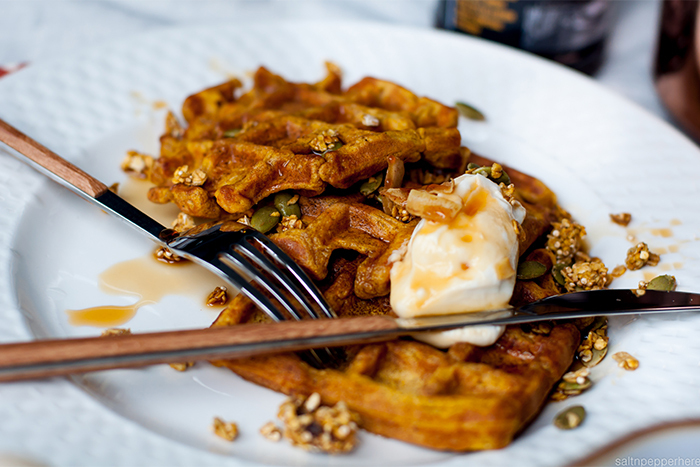 Make Advance Option: Waffles are best enjoyed hot and fresh from the iron. However, if they become soggy from sitting around you can revive them in a toaster oven or toaster for a few minutes and they come out crispy again. 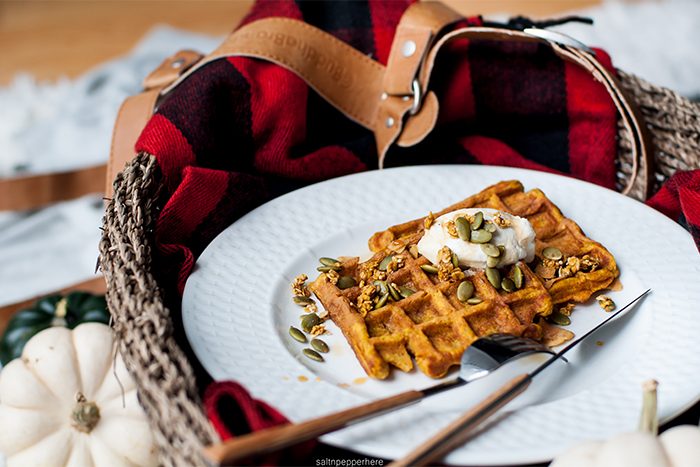 Leftover waffles can be laid flat inside a ziptop bag or freezer-safe container and frozen for 2-3 weeks. Stacking them directly on top of each other inside the bag or container for freezing seems to work fine for me and I have no issues separating the waffles with little resistance when ready to reheat in the toaster. Yay! Recipe via here. 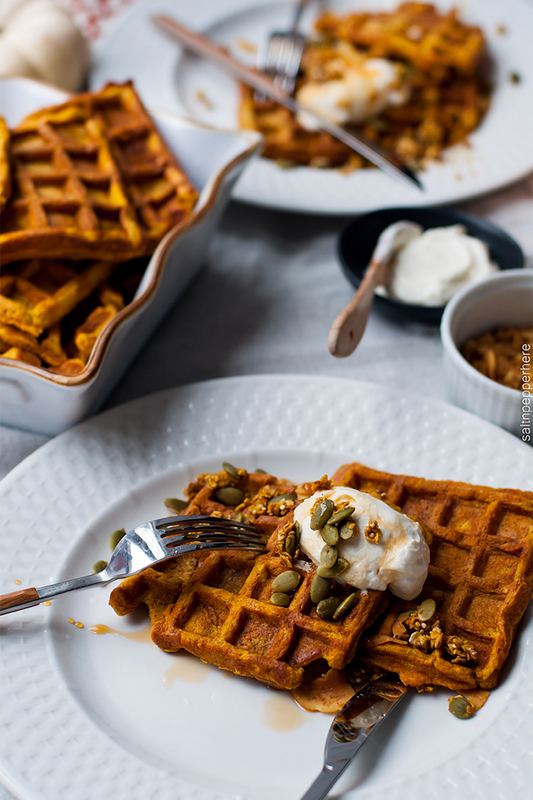 Makes 4 round “Belgian” style pumpkin waffles. Combine brown sugar and cornstarch in a large bowl. Whisk together to break apart the cornstarch. Add the remaining dry ingredients, and whisk to blend. Add pumpkin and milk to the egg yolks. Whisk to blend and set aside. Whip egg whites with a hand mixer on highuntil stiff peaks formor about 1 1/2 – 2 minutes. Set aside. Pour melted butter into the yolk/milk/pumpkin mixture. As you pour, whisk to combine. Once the waffle iron is heated, pour the batter and cook based on manufacturer’s instructions. I hope you have an extremely Happy Thanksgiving and for more food inspiration, be sure to follow my dear friend Sonia via her blog or Instagram (it’s a must! ).